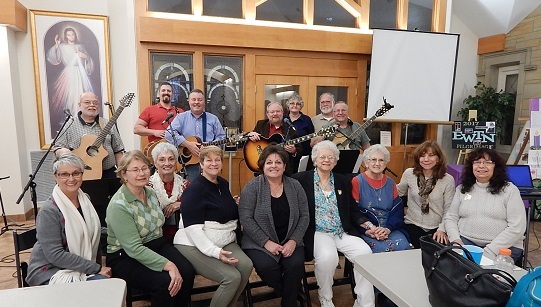 To celebrate Christmas and our Saviour's birth, our many talented musical parishioners offer their talents; ICC Guitar Group, ICC Choir, our amazing organist (Dawn Slike) and the Slike brothers. 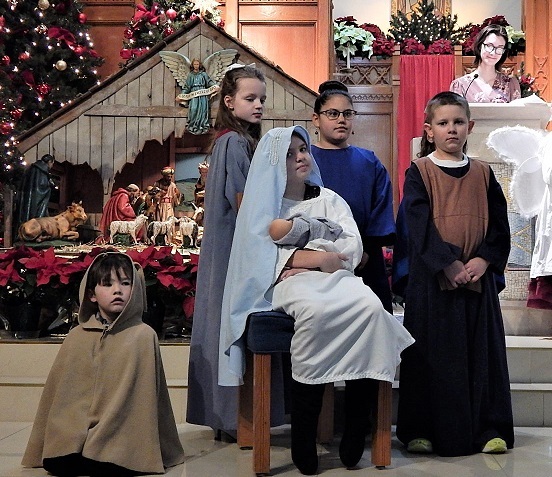 In preparation for Christmas, our young parishioners (preschool through 12th grade) reenact the Lord's Nativity. The play was directed by Mrs. Julie O'Brien and Mrs. Rebecca Owoc. Both ladies have freely given many years of service teaching our young people the importance and history of Jesus' birth. Sincere appreciation to all our participants (little and big), along with their parents. Thank you to ALL Veterans who joined us for our first ICC Veterans' Mass. The evening honored all veterans who have served and still serve today to protect our country and its freedom.A special thanks to Father Donnelly and the Knights of Columbus for the celebration of the Mass. Latin: "Mass for the People". On November 15, 2018 many attend a Pro-Populo Mass in remembrance of those who passed away in the past year. Thanks everyone for coming together to make this a wonderful & successful parish event! From the decorating, baking of cupcakes, all the teens and adults who helped run the games, to the parish members that decorated their cars and the families that came out in the cold and drizzle to trick-or-treat. To celebrate The Feast Day of Saint Francis of Assisi, Spiritual Development Ministry, Deacon Ken Meade and Wednesday PSR classes hold our annual parish Blessing of Pets celebration. In Your infinite wisdom, Lord God, when You created the Universe, You blessed us with all living creatures. We especially thank You for giving us our pets who are our friends and who bring us so much joy in life. Their presence very often helps us get through trying times. Kindly bless my pet. May my pet continue giving me joy and remind me of Your power. May we realize that as our pets trust us to take care of them, so we should trust You to take care of us, and in taking care of them we share in Your love for all Your creatures. Enlighten our minds to preserve all endangered species so that we may continue to appreciate all Your creatures. Grant this through Christ our Lord. Amen. The ICC family and friends gather annually to celebrate our love for the Lord, one another and community. This year’s 6th Annual Picnic was a hit! Everyone had a great time and the weather was just beautiful. Our amazing Knights of Columbus grilled hamburgers and hot dogs and did a great job keeping up with the hungry crowd. To much delight, Jill Chiro, Julie O'Brien and the PSR volunteers ran the children's games. A special "shout out" to all our amazingly talented performers who entertained us all afternoon. The ICC Parish would like to thank all the helping hands that made this picnic possible, all the volunteers that set up and did the cleanup, removed empty dishes from the chiller tables, our Ice Cream scoopers, trash removal, beverage haulers and a huge "High 5" to the picnic committee for their planning and time spent picking up food, ice and beverages. Also, all the wonderful side dishes our Parish members brought were a heavenly delight. We hope to see you next year at our 7th annual Parish Picnic! During the week of June 18-22, ICC held it's annual Vacation Bible School (VBS). This year, the theme was Shipwrecked and the kids discovered how Jesus is our rescuer! 22 preschoolers and 40 elementary kids participated along with 30 middle and high school helpers and 20 adult helpers. It was a week filled with creative games, tropical treats, incredible music, amazing crafts, and Bible adventures - all reminding them of God's love for them. Kids also learned to look for evidence of God all around them through "God Sightings". Confirmation is one of the seven sacraments through which we pass in the process of our religious upbringing. According to Catholic doctrine, in this sacrament we're sealed with the gift of the Holy Spirit and are strengthened in our Christian life. 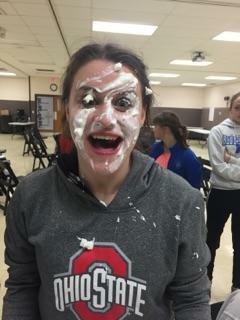 Please pray for our Cofirmondi. 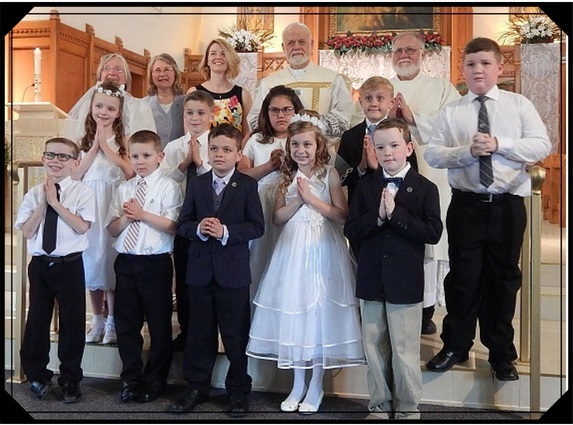 First Holy Communion is the common name for a person's first reception of the sacrament of the Eucharist. Roman Catholics recognize the importance of this event as the Eucharist is the central focus of the sacramental life of the Catholic Church. Special clothing is usually worn, which is often white to symbolize purity. Pope Pius X declared Blessed Imelda Lambertini the Patroness of First Communicants (click her name to learn more) in the early part of the 20th century. The life of this young child was quite astonishing. She lived only from 1322 to 1333; a time in the Latin Church when First Communion was reserved for children of at least 14 years. Please pray for our First Holy Communicants through the intercession of Blessed Imelda. 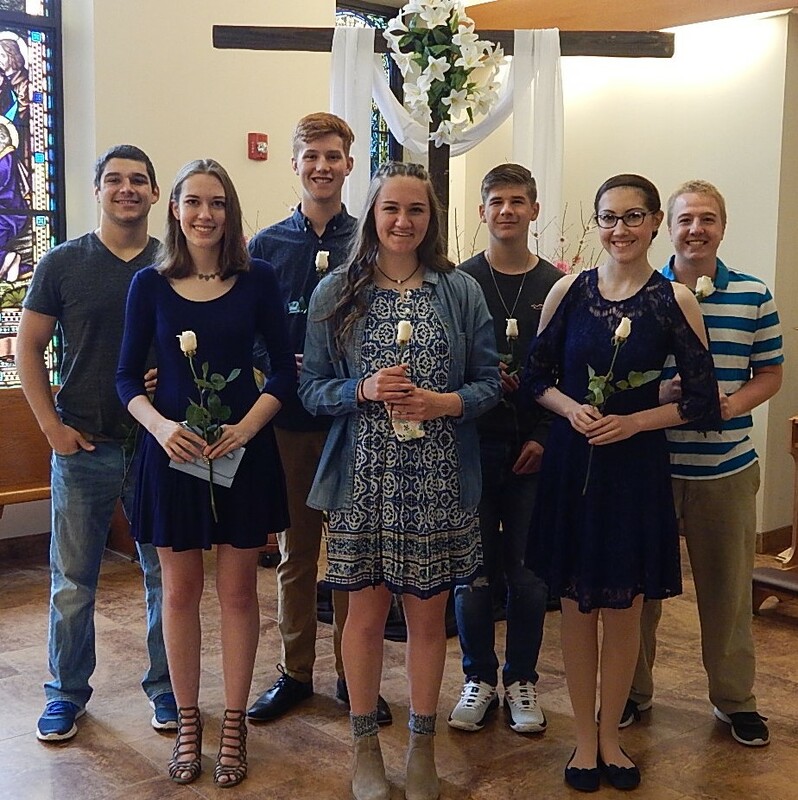 A Baccalaureate Mass is a celebration that honors our 2017 graduating senior class! 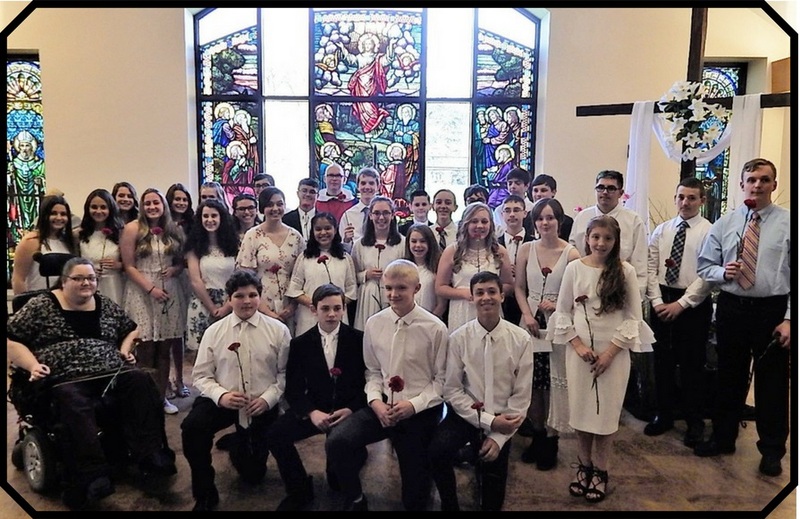 In honor of Our Lady of Fatima, ICC parishioners celebrated the yearly May Crowning Mass on May 12, 2018. 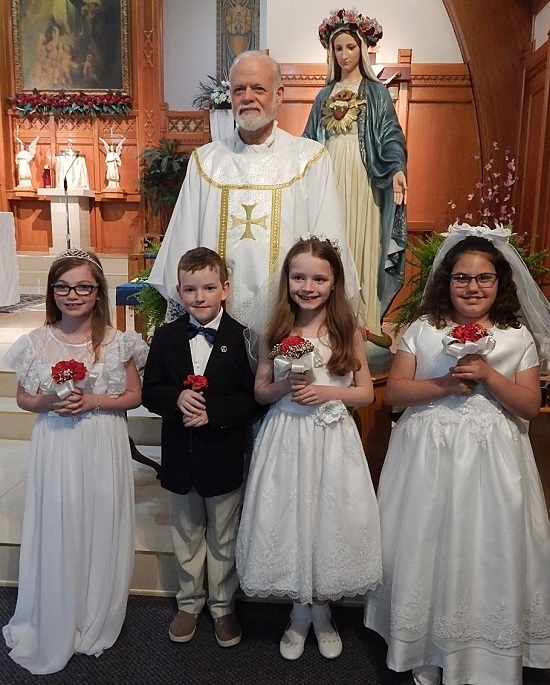 A few of our First Communicants participated and presented the crown. The May Crowning is a celebration that recognizes Mary as queen of heaven and earth. Devotion to our Blessed Mother Mary originates in the earliest days of the church. Concerning the significance of the month of May, a month both named for and dedicated to Mary, toward the end of the 18th century, Father Latomia of the Roman College of the Society of Jesus (in Rome) instituted the practice of dedicating this month to our Blessed Mother. Catholics have long honored her by placing a crown on her image. A sincere "thank you" to all participants. Congratulations to our PSR Preschool students as they graduate into Kindergarten. 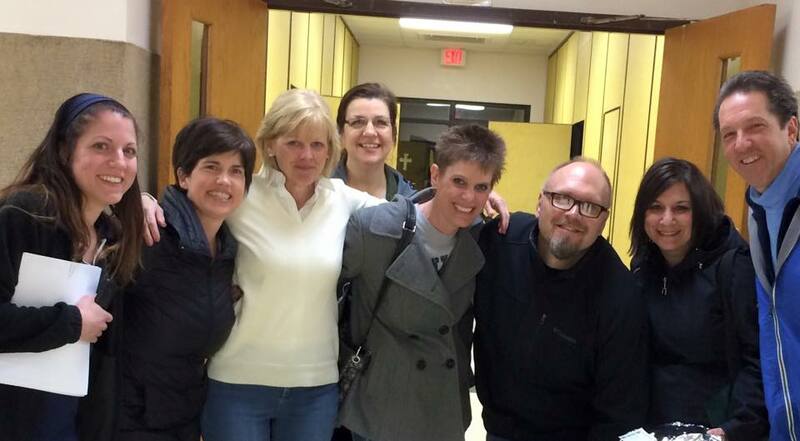 Several members of our ICC family enjoyed our annual Easter egg hunt. Many also delighted in hugs from the Easter Bunny. To many Christians, the Easter egg represent Jesus' tomb and resurrection. This association came when Roman Catholicism became the dominant religion in Germany in the 15th century and merged with already established pagan beliefs. Spring is also a symbol of new life and rebirth. According to some sources, the Easter bunny first arrived in America in the 1700's with German immigrants who settled in Pennsylvania and transported their tradition of an egg-laying hare. In preparation for First Holy Communion, 2nd grade PSR class reenacts the Lord's Last Supper. The play was directed by Mrs. Bonner. Additionally, Mrs. Bonner has freely given many years of service teaching ICC's First Holy Communicants. Many sincere thank you's to Mrs. Bonner! Our 2nd grade class, in preparation for First Holy Communion, shared loaves of bread symbolizing Jesus, our Bread of Life in the Eucharist; Body, Soul & Divinity. Palm Sunday the Church transformation takes us to the time where Jesus enters Jerusalem. The church colors change from purple to red. On Good Friday the altar is stripped of all decoration. As we reflect on the death of Jesus on the cross. The tabernacle is empty and the curtain open. Jesus is gone. After 40 days of prayer, fasting and almsgiving, we celebrate the Resurrection of our Lord on Easter Sunday. 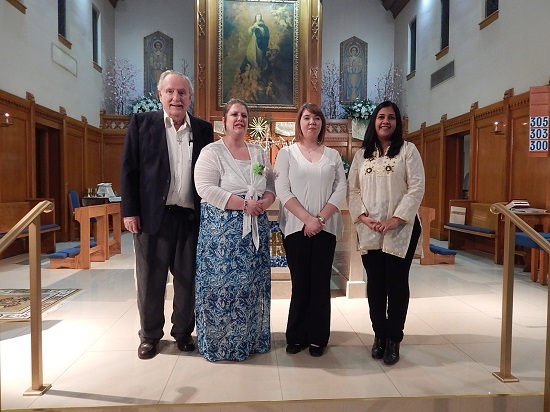 We welcome Larry Small, Amanda Brafford, Ashley Myers and Reene Widmar to our Catholic Family. Congratulations to all of you! The Mosaic came from Henningers Inc. A Mosaic is a piece of artw work made of pieces of colored stone arranged to form a picture. 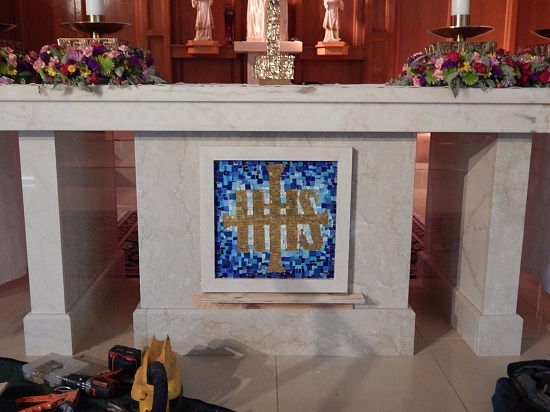 The mosaic is in shades of blue with a gold monogram, "IHS". IHS is a monogram being a symbol of Jesus Christ in form of acronym. From Greek it is an abbreviation of the name IHΣΟΥΣ (Jesus). This is a beautiful addition to our main altar and sanctuary. Did you know ICC has two Small Home Based Christian Communities within our parish? They are the St. Pio Community, hosted by Gayle Carroll, and Sacred heart Community, hosted by Danny and Lorraine Pettit. These communities meet once or twice a month in family homes. A typical evening meeting consists of praise and worship (singing & prayer), a short teaching on the Catholic faith, and sharing of daily lives along with great food. Most communities have some type of apostolic outreach. For example, Sacred Heart Community promotes the enthronement of the Sacred Heart in homes. Pope St. John Paull II wrote about these home-based communities as an extension of the parish community. Thus, the parish can truly be a community (Lay Members of Christ's Faithful People). Deacon Ken and Shelley Meade have been memebers of St. Anthony Community in Bainbridge, Ohio for nearly 20 years. As members of Presentation Ministries, they helped introduce Small Home Based Christian Communities to ICC & we are forever thankful! Volunteers clean up our Blessed Mother Shrine landscaping. We look forward to God's beauty to bloom. A Funeral Mass was held at ICC on Saturday, May 21, 2016 for two babies, Matthias and Angela. The burial occurred at North Madison Cemetery. Baby Matthias was miscarried at 17 weeks. Baby Angela was stillborn at 33 weeks from conception. She was fully formed and weighed five pounds. The babies' bodies were left with the coroner. 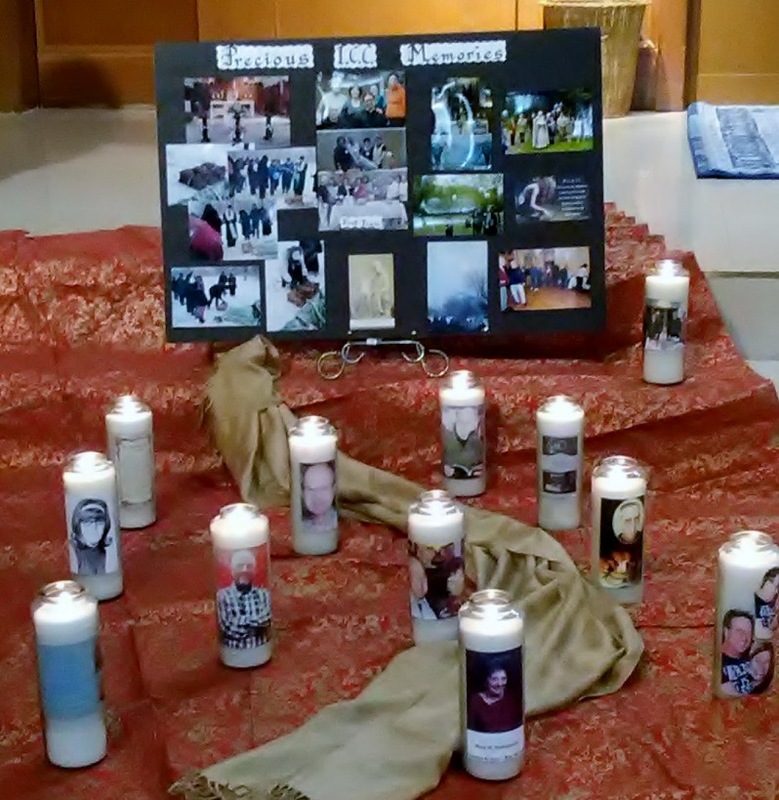 Arrangements were handled by Behm Family Funeral Home, 26 River St., Madison. Plot donated by Grace Muller. We are all indebted to Jesus for His Passion. Similarly all of us are indebted to Our Lady for her compassion. Legion of Mary is a lay apostolic association of Catholics who with the sanction of the Church and under the powerful leadership of Mary Immaculate, Mediatrix of all Graces serve the Church and their neighbor on a voluntary basis. 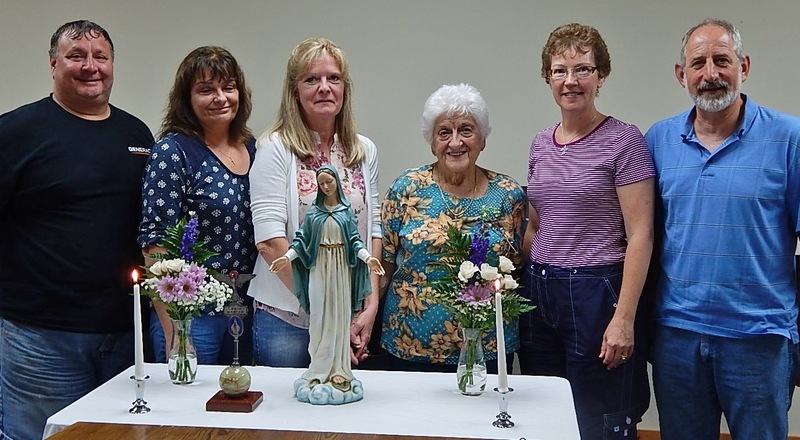 Every week each active member in the Legion of Mary is assigned a legion work for not less than 2 hours. Some of the works we do include: Apostolate in the Parish, visitation to homes of the homebound, visitation of hospitals and nursing homes and other duties assigned by the Pastor. At this time as we know Father Donnelly is out on sick leave. The Legion is greatly needed at our Parish. Please consider joining us as we need more members to be able to expand our works. We also encourage people to have their homes Enthroned to the Sacred Heart, recitation of the rosary at wakes and funerals and much more. This is a short summary of what we do. If interested in joining, please call the Parish office. 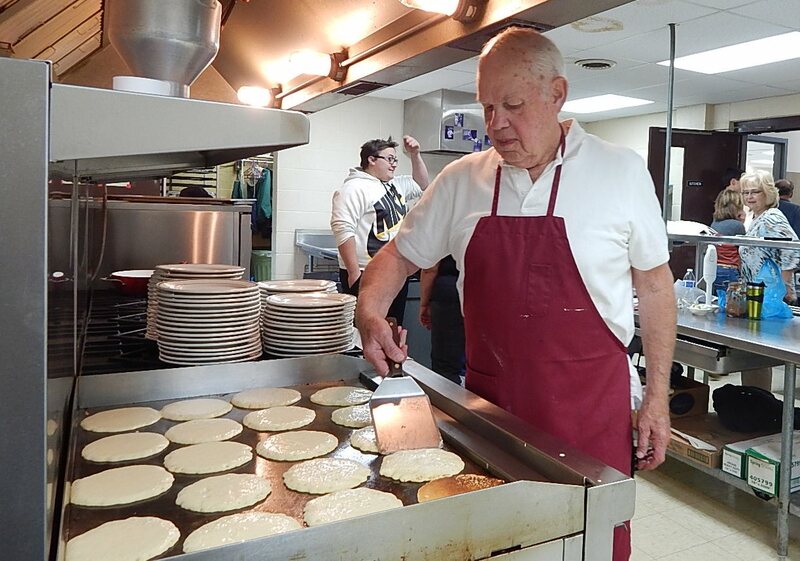 Our amazing volunteers utilize their gifts of welcoming and hospitality to bring the ICC parish family and Madison community members together for fellowship through a delicious meal before or after Sunday Masses. In April 2015 Pat Covell was made aware that the current practice around our country is to give each child who enters foster care a trash bag to put their belongings in. 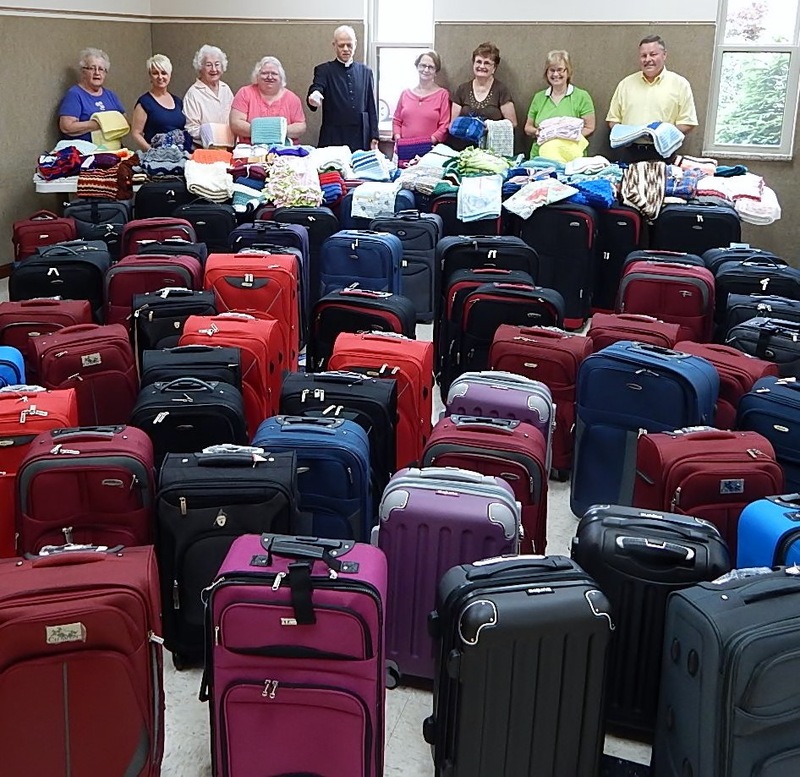 With Father Donnelly’s blessing, the generosity of parishioners and a discount from Gordmans in Mentor, we were able to purchase 100 suitcases. 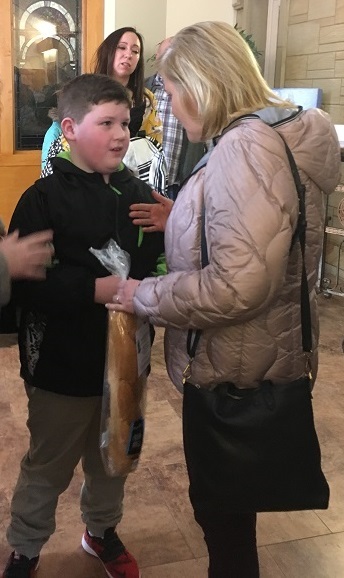 The Prayerful shawler’s and Blankets for Babies, along with parishioners came together and donated their time and talent to make sure each child would have a small blanket to go along with a suitcase to call their own. On June 8, 2015 Father Donnelly blessed each suitcase and blanket and on June 9, 2015 the Covell family delivered them to Lake County Foster Care Services. They have promised to let Pat know when they get low or need additional suitcases. Our prayer is that no child in our county will ever have to use a trash bag again! We are truly blessed at ICC to have Father Donnelly and our church community living the Corporal Works of Mercy. Please keep these children in your prayers. A special mention and thank you to Dorothy Zupcsan who made 44 of the blankets. We are blessed by the love and dedication of so many parishioners that freely give of their time to teach our beautiful Catholic faith. A heartfelt "thank you" to all of our PSR teachers. Don't travel outside of Madison to shop! We have hidden treasures at the ICC Gift and Book Store, located in our parish center. It has been in existence for many years and we'd like to invite all parish members to check us out. The Gift Shop carries a wide variety of gifts for First Communion, Confirmation, Baptisms, seasonal items, holy cards, greeting cards, rosaries, statues, crucifixes, medals, bibles and books. Also featured is our rolling book cart filled with many Christian books, all for $1.00 each. All proceeds are given to our ICC Scholarship Fund. Please come and visit us on Sundays from 9:30am to 12:30pm. Celebrate fellowship monthly with our family-in-Christ on every 4th Sunday! God's creatures make their home at ICC too. Many thanks to Avalon/Glavis Pest Control for their assistance with this bald face hornet's nest found in the outside garage. They explained it took about 2 weeks for the hornets to build their home, which appeared to be vacant from last fall. Additionally, Avalon/Glavis removed a nest of yellow jackets from the Parish center. This gives a new meaning to "when the cows come Home"! All are welcomed at ICC, especially by our Blessed Mother. Please contact the Parish Office at (440) 428-5164 or office@iccmadison.com.